The SparkFun Simblee Breakout Board is a programmable board that allows you to add mobile app functionality via Bluetooth Low Energy (BLE, or Bluetooth 4.0) to your embedded projects. Unlike other BLE solutions, the Simblee requires no specialized app development skills to realize the phone-side interface; all the necessary coding is done in the Arduino environment and then uploaded to a browser app on the phone. If you want to skip directly to writing code, we have another tutorial covering coding concepts that are common to all Simblee products. If you're looking for a sewable solution, checkout out our Simblee LilyPad Board. There are a few topics you may want to be sure you understand before you go any further. Bluetooth Basics - While Bluetooth 4.0 is quite different to previous versions of Bluetooth, our Basics tutorial will give you some insight into the methods and goals of Bluetooth in general. Serial Communication - You'll want to make sure you understand serial communication, as that will be a major means of debugging your Simblee sketch during development. Logic Levels - The Simblee runs at 3.3V. Make sure you understand the difference between 3.3V and 5V logic levels before you start connecting things to the Simblee or you may damage it! 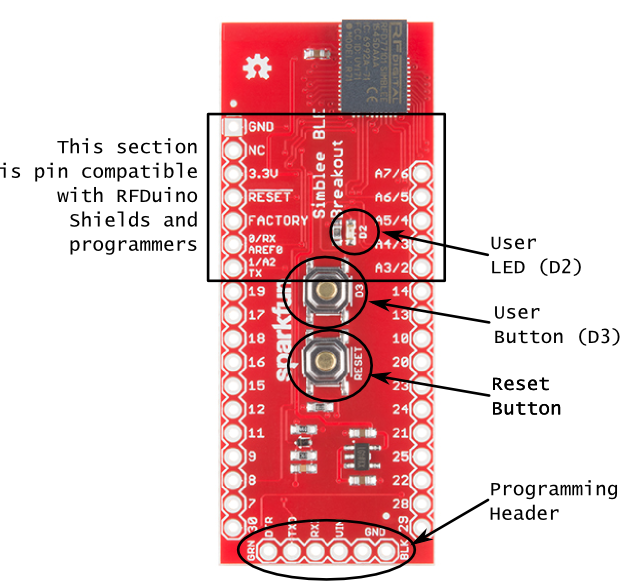 RFDuino Compatible Pin Section -- The top section is compatible with the RFDuino shields and programmers. User LED -- We've provided a user controllable LED on pin D2. This allows you to get some feedback without any additional hardware at all. User Button -- Similarly, we've provided a button on pin D3. Don't forget to use INPUT_PULLUP when setting the mode for that pin in the code! 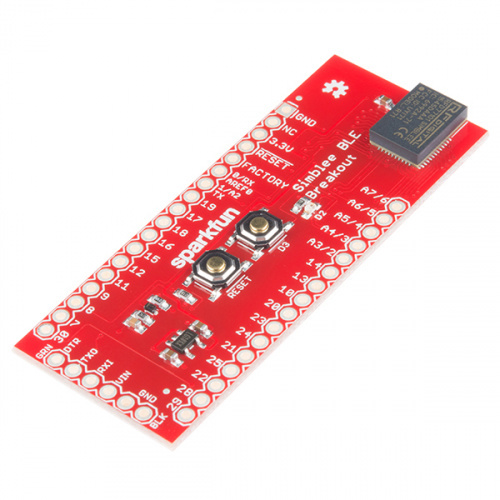 Programming Header -- While you can use the RFduino programmer, we've provided a standard 6-pin FTDI breakout programming header as well. This allows the profile of the board to remain low unless necessary. We recommend using the either the LilyPad FTDI Basic or the 5V FTDI Basic for programming the Simblee. Do not use the 3.3V FTDI Basic. Do not use the 3.3V FTDI Basic, as it may not be able to source enough current from the 3.3V rail. Warning: If you've used Arduino boards before, you're probably used to connecting LEDs to the pins as output signals. A normal Arduino can light up many LEDs at once, and several per pin; for the Simblee, you shouldn't try more than ONE per pin, with an additional recommendation of don't try to turn on more than three at a time across all pins. The processor inside the Simblee module cannot drive enough current to light up more LEDs than this (pg 9 of the Datasheet). If you decide to drive multiple LEDs, try using a transistor as a switch. That concludes the hardware overview for the Simblee Breakout. For more information on using the Simblee to create your own applications for embedded project, visit our Simblee Concepts tutorial. Need some inspiration for your next project? Check out the project below from our creative technologist with a Simblee, pulse sensor, vibe motors, accelerometer, and 3D printed wrist bracer. The documentation of the project can be found in the GitHub Repository below. For more info on the Simblee module itself, please have a look at the **Simblee User's Manual **. Simblee for Mobile reference -- PDF covering the basics of using the Simblee for Mobile Library to make a UI on a host device. For more Bluetooth fun, check out these other SparkFun tutorials.